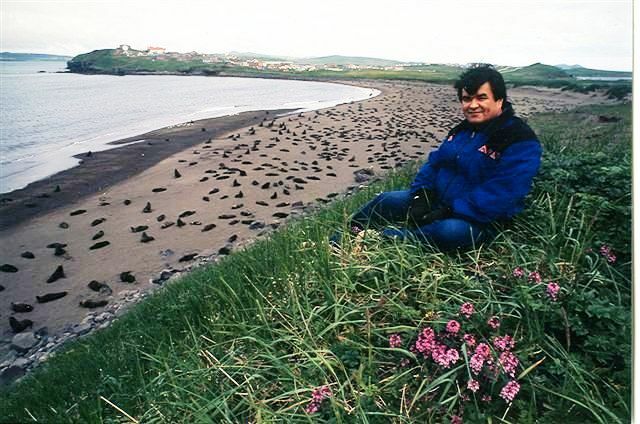 Larry Merculieff on Saint Paul in the Pribilof Islands where he grew up with fur seals on beach beneath and village of Saint Paul behind him. 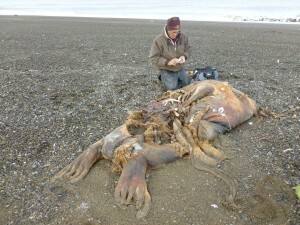 Willard Neakok, Eskimo Walrus Commissioner studying dead walrus at Point Lay haul-out. Long before climate change dominated headlines, Alaska Native elders noticed that major shifts were taking place in their environment. It is not surprising that people living in remote place depending on wild fish and game should have a sophisticated and intimate knowledge of the weather and its impacts on the wild food they depend on. But the elders went further. Forty years ago, elders advised the young to prepare for hard times.